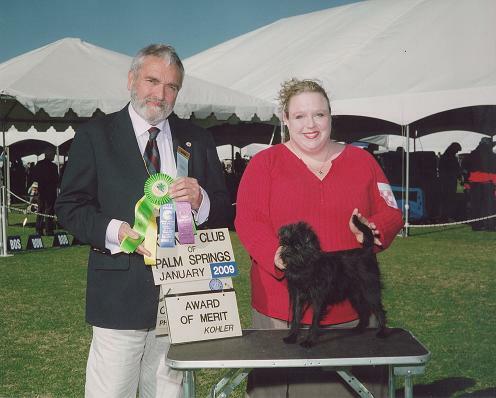 California Affenpinscher Simma of Turloch Kennels Gets a Major, Best Bred By and Award of Merit! The first show of the year put on by the Kennel Club of Palm Springs in Indio, CA is a pretty big show with people and dogs coming from all over the country to compete. Saturday was a disappointing day for us due to a flat tire and missing our ring time. Sunday turned out much better. Despite my bumbling and rusty efforts at handling (its been a while) Simma won WB for a 3pt major, Best Bred By and an Award of Merit. Under Judge: Mr. Michael Forte from Ireland (Erin go braugh!). Simma (Turloch’s Simma Down Now) is the Grandaughter of Isabella and Teaser. Daughter of Baby Bella (Ch Turloch’s Bellissima) and Sprocket (Ch Turloch Dieter’s Sprocket Monkey). Welcome to Turloch Kennels of California we strive to produce the Best in Breed Affenpinschers. At Turloch Kennels of California, we strive to produce the Best in Breed Affenpinschers. If you are looking for a commercial breeder (puppy mill) you have come to the wrong place. We only produce a few litters per year and are extremely selective to whom we place our puppies with. We are focused on the Affenpinscher breed which is one of the rarest in the world. The Affenspinscher originated in Germany and like most small dogs were bred to be ratters. They then charmed their way into being companions with their cute monkey-like personalities. Please visit our Affenpinscher section for more information about the breed and our own dogs. Please also take a look around the rest of the site and let us know what you think. If you have any questions, please don’t hesitate to contact us . All of our information is on the contact page. If you are interested in one of our dogs, please fill out an application under “contact us” and we will contact you for more information. Also, if you are interested in a family pet and would like to give a dog another chance, we suggest contacting the Affenpinscher Rescue to see if there is someone there that would make a great addition to your family. On January 6th, 2009 Baby Mama (Bellissima’s sister) gave birth to 7 puppies sired by Sprocket.